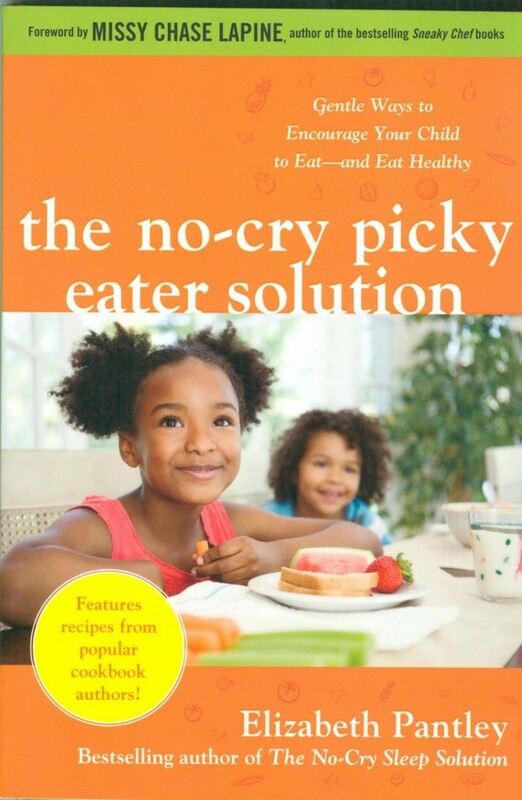 So how does The No-Cry Picky Eater Solution stack up against my champion picky eater? I think Elizabeth Pantley herself would say it’s far too early to tell, but overall I really like this book. I think a great strength of this book is that Pantley acknowledges just how frustrated, concerned, and hopeless parents of picky eaters can feel, and then, rather than offering a flashy quick-fix, counsels patience above all else. She manages to provide sympathy while at the same time reminding readers that you can’t change picky eating overnight, and more importantly, it’s not urgent that you do so. Don’t get me wrong, she lays out great information about how important it is to get kids eating lower sugar, lower sodium, and more whole grains and produce. But she also emphasizes that it doesn’t need to be instantaneous, and it’s more important to work on developing good habits for the long haul, rather than getting broccoli into your kid tonight. I also like that the book addresses a wide array of kid pickiness. Extreme kids like mine who will only eat beige foods and no vegetables are specifically mentioned, as are kids who don’t seem to eat enough, or who never eat whole grains, as well as kids who don’t seem compatible with the “always eat breakfast” rule or those who can’t seem to sit at a table with the family. Pantley manages to address all these concerns by laying out a general structure that covers most situations: Attitude, Environment, Amounts, and Rule, and then offering a tips and Q&A section for specific scenarios, like how to picky-proof your young toddler, or how to reverse if you’ve already established a routine of being a short-order cook. I really liked the Amount section, which actually tells you what a “serving” is for a little kid. So many books, web sites, and info sheets from the pediatrician have instructed me to give my kids X servings of milk a day, without any guidance on what that means in ounces. If you’ve ever been confused about this, it’s worth getting this book just for the serving size tables. The Q&A section reinforced for me some things I already knew – serving a family dinner is hugely beneficial, kids need to have new foods on their plates 10-15 times before they’ll even take a taste, and consistency is key. But it also alerted me to something I’ve been doing to undermine my own efforts – not making sure my kids are hungry when I serve them nutritious foods. I especially love the idea of serving fruits or vegetables as an “appetizer,” so that the kids have only the healthiest option in front of them when they are hungriest. I’ll also be more strategic about pre-dinner snacking and even about when I serve milk with a meal, in an effort to capitalize on hunger as a tool. The one part of the book I found lacking was the recipe section. It’s billed as “Recipes Even Your Picky Eater Will Love,” but to say that’s optimistic is an understatement. There’s no way that my picky kid will be seduced by fried rice, black bean and sweet potato stew, or broccoli-asparagus-mushroom pancakes. I certainly hope someday she’ll be up for stuff like this, but in my mind these recipes are decidedly in the “Advanced” category for a picky eater. Much more helpful were the earlier tips Pantley gave about “food-chaining,” gradually morphing unhealthy favorites into more nutritious versions of themselves, using tiny baby steps like replacing one slice of bread in a peanut butter sandwich with a whole-grain blend, or adding a spoonful of healthful cereal to your kids favorite sugary cereal, then slowly increasing the ratio over time. So on the whole, I found this book very useful. Not only does it have some good information on nutrition and an array of ideas about getting a picky eater to eat better, but it offers support to frustrated parents, and reminders of why it is important to keep up our efforts day in and day out, even when we feel frustrated.